In the summer of 2005 soon after completing the first grade, our son Grant, an otherwise extremely healthy and energetic seven-year old, contracted a seemingly common viral infection. After several days and multiple visits to his pediatrician, Grant’s symptoms progressed to the point that he suffered seizures and was admitted to Texas Children’s Hospital Pediatric Intensive Care Unit in Houston for stabilization and extensive diagnostic testing. After numerous intravenous antibiotics failed to counter the unknown and as the seizures continued, the decision was made to medically induce a coma. Grant’s medical teams monitored his progress as numerous inconclusive diagnostic tests were performed and a battery of treatments were administered. Attempting to identify an elusive virus was a time intensive and heart wrenching process. In early August family, friends, the community and doctors remained positive as the seizures subsided. Tragically, a CAT scan revealed the virus had attacked his brain and Grant suffered irreversible neurological damage. Grant passed away on the afternoon of August 9. Autopsy results confirmed what Grant’s doctors had searched for to no avail…the virus that attacked him remains unidentified and the diagnostic attempts were inadequate to establish proper treatment. While great strides have been made in medicine, the technology to quickly identify and treat new strains of bacteria and viruses is severely lagging. The doctors at Texas Children’s Hospital and Children’s Memorial Hermann Hospital are actively seeking to advocate on behalf of children (and adults) to make improvements in the area of diagnostic testing. 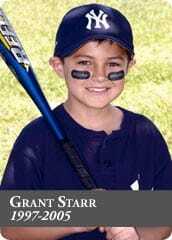 As we celebrate Grant’s life and share our tragedy with you, we begin the Grant-A-Starr Foundation with hopes of helping other children to never endure his ordeal. Your much needed financial support will make a difference towards something positive….the advancement of pediatric diagnostic testing.